Brian Sawatzky has been trying to reduce his carbon footprint for the past 20 years. Six years ago he purchased the Confederation Inn (3330 Fairlight Drive, Saskatoon) and saw it as an opportunity to put his ideas into practice. 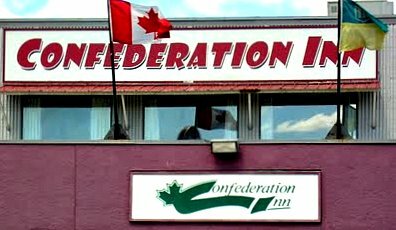 The Confederation Inn is an independent hotel, and this was a huge advantage as Brian was able to experiment and try out different approaches. Brian was interested in saving money as well as reducing the hotel’s carbon footprint. The solar panels on the roof of the hotel are the most obvious sign that this is an environmentally-sustainable hotel, but Brian says that the payback on other items has been much bigger, and he proceeds to list all the different methods he has used to create a more environmentally-friendly hotel. Temperature controls: It’s a warm summer day and the air conditioning is running, but it’s nowhere near as icy-cold as it is in many other public buildings. The hotel maintains its indoor temperature during the summer at around 24 degrees, and around 20 degrees during the winter. Brian says people accept that range, and he saves a lot of money. The thermostats in all the rooms are now programmable. This cost approximately $20-40 per unit but has paid for itself in much less than a year. The thermostat in the pub is turned down to 15 degrees overnight in the winter, and it only takes half an hour in the morning to get the temperature back up again. If the banquet room won’t be used for a few days, the temperature is turned down to 13-14 degrees. “We turn it down as low as possible without freezing anything or getting frost build-up,” Brian explains. Fans: Brian installed ceiling fans in the banquet room and the restaurant. In the winter, the fans move the heat down to where the people are, and in the summer they help to cool the air so less air conditioning is required. In the kitchen, a mammoth fan is pointed at the cook to keep her cool while she works. Windows: As the windows break, they are replaced with triple-pane glass. Plastic over the windows in the pool area has got rid of the drafts and raised the temperature. The hotel has installed awnings on the two suites on the south side of the building. Brian says that this has reduced the summer air conditioning bill for those rooms by half by keeping the heat out. Brian plans to install awnings on the west side of the building but is still looking for a cost-effective system. He wants to be able to remove the awnings in the winter to take advantage of the solar heat. Insulation: Uninsulated exterior doors have now been insulated. This has done away with the ice build-up and significantly reduced heat loss in the winter. Air conditioning units are covered in the winter to reduce drafts. Brian plans to add additional insulation to the inside of the north wall of the banquet room. He'll upgrade the insulation on the roof when it's replaced. Solar hot water: Brian obtained two grants that paid for approximately half the cost of installing 40 solar hot water panels. He figures he saves approximately $7-8,000 a year on natural gas. He maintains the old system as a back-up for cloudy winter days. If you have a backyard swimming pool, Brian recommends installing solar hot water. Solar heat is readily available in the summer, and you’ll generate as much heat as you’ll need. He also recommends a pool cover. The hotel covers the hot tub at night. This is a big savings in the summer; less heat escapes, so less air conditioning is required. Brian is starting to use LED lights, but it has taken time as the first lights weren’t very good. “They’re better now,” he says. “They’re cheaper, have a better colour range and put out more light.” All the lights are LED, except for four fluorescents, in the small meeting room. In the past, it would have required 1000 watts to light the room; it now requires 100. LED lighting is particularly helpful in hard-to-reach areas (e.g. street lighting) or when the lights are on 24 hours a day (e.g. exit signs) as incandescent bulbs need to be replaced every 1,000 hours, whereas LED lights last for 15-20,000 hours. All the public washrooms now have motion sensors so the lights only come on when someone enters the room. One of the biggest energy guzzlers in the old restaurant was a conveyor-belt toaster. It was running constantly and generated a lot of excess heat. It’s been replaced by enough pop-up toasters to satisfy peak traffic. They have almost as much capacity as they did in the past, but they’re only using one tenth the electricity. Tipping fees were a major expense in the past as cardboard boxes went straight into the bin without being flattened. Now that the cardboard is recycled, they have gone from 4 garbage pick-ups a week to one, and are saving $9,000 a year. Brian burns the filtered vegetable oil in his Volkswagen Jetta. All the table linens and towels are brown, so they don’t require bleach and don’t have to be thrown out as soon as they become stained. The hotel uses recycled paper products (e.g. napkins) from Cascade. The large beer cooler in the off-license used to be cooled with water at over $4,000 a month. They switched to a new system with a coolant that can be recycled. The new system cost $40,000, but it has paid for itself in 1½ years and is now saving them $2,000 a month. The hotel is switching to low-flow toilets (6 litres in the past, 3-4 litre, single-flush toilets in future) as the fixtures are replaced. All the shower heads have been replaced. Most stores offer 2.5 gallons/minute low-flow shower heads, but Brian found 1.5 gallons/minute shower heads that were quite good and hasn’t had any complaints. Aerators on the faucets have reduced the flow from 2 gallons/minute to .5 gallons/minute for a 75% saving. Brian replaced the majority of the electric outlets in the parking lot with intelligent parking lot controls. If it’s warm, the electricity doesn’t flow, and it shuts itself off, coming back on more frequently in colder weather. The controls cost $180 each but are now eligible for a rebate from SaskPower. Taxi drivers are not allowed to idle their vehicles while waiting for passengers, and Brian plans to extend this policy to all drivers. He will install LED lights in the parking lot once the price goes down. Brian knew that his green initiatives would only be effective if he had buy-in from his staff. The managers now receive a percentage of the hotel’s gross revenue minus half of the utility bill as part of their pay package, so they are personally motivated to avoid wasting power. The Saskatchewan Environmental Society’s annual fundraising banquet, the Sustainable Gourmet, is held at Confederation Inn. It’s certainly appropriate. 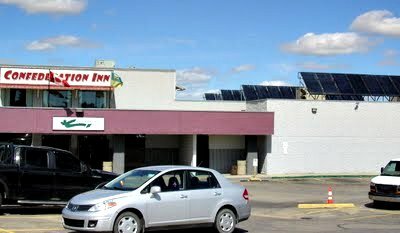 Confederation Inn is one of Road Map Saskatoon’s Sustainability Champions.